A couple of months ago, I booked a trip to Phoenix during Thanksgiving. Although I was able to do it using my points, the flight times weren’t ideal and I was stuck with long connections in Las Vegas and Los Angeles. I went ahead and booked the flights anyway, because when it comes to award tickets, the perfect should not be the enemy of the good. After all, when you’re flying for free, you’re getting the itineraries that nobody wants to pay for and this is particularly true during holiday periods. However, even though I originally booked a less than perfect itinerary, I’m now flying a much better one. How? By taking advantage of schedule change rules and award policies. I successfully did this on both legs of my flight, and here’s how I did it. 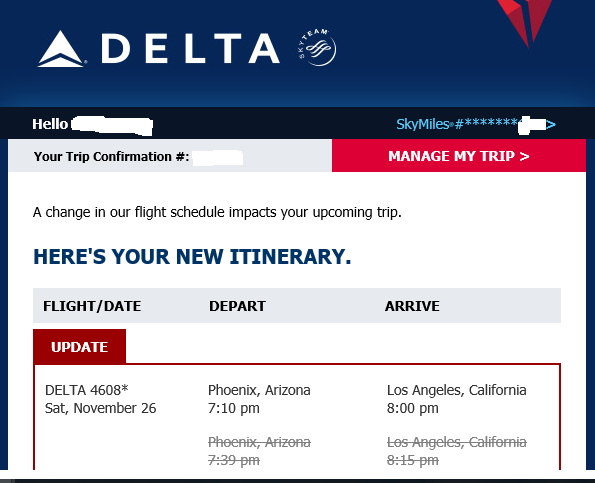 I received an email from Delta indicating that my schedule changed. When Delta changes your flight with a departure or arrival time that is more than one hour from the original itinerary, they will allow you to change it online. Unfortunately, this itinerary didn’t qualify; it was only a 29 minute change. However, I figured there might be an opportunity to change my flight if I called in. Could this be an opportunity? When I called in, the representative was at first unwilling to make any changes. However, I explained that the new schedule would interrupt our holiday dinner plans, and asked whether it’d be possible to choose a later flight. Of course, I had an exact flight number and time to suggest, which happened to be a more convenient nonstop flight. When the agent came back on, she was willing to make a schedule change. However, she refused to put me on the nonstop flight I requested, because–as she put it–I was required to take a connecting flight since I had originally booked one. My plans foiled, I still ended up with a better itinerary. My new flight left at 7:40PM, connected in Salt Lake City, and arrived at 11:32PM. I was happy to take it. The new itinerary was operated entirely on Delta mainline aircraft (versus Delta Connection and Alaska Airlines), and arrived a full hour earlier in Seattle than my originally scheduled itinerary. So, while this wasn’t quite a slam dunk, it’s an entirely reasonable itinerary. One little-known perk of American award tickets is that you are free to change the times and routings of award tickets as long as the origin and destination remain the same. Date changes are also free as long as they are outside of 21 days in advance (if you change to a date inside of 21 days, however, a $75 fee applies). What does this mean in practice? When you’re booking an award on American, grab whatever you can. If a better itinerary opens up later, you can call in and switch to it. My original itinerary had me leaving at 8:30am (not my favorite time of day to fly, because it means a 5:30am start), flying Alaska Airlines to Las Vegas, changing terminals, and connecting to an American flight two hours later . I wouldn’t arrive in Phoenix until three in the afternoon. Now, don’t get me wrong. The ticket was free and I was happy to have it. However, I kept checking for a better itinerary, hoping that one opened up. If anyone wants it, here’s the itinerary I ditched. The seats I gave up were returned to award inventory! Today, that happened. Alaska typically returns award seats to inventory if they are cancelled, and–likely due to a cancellation–a single award seat opened up on a nonstop flight leaving at 2:55pm on Wednesday afternoon. I immediately called American Airlines and grabbed the seat. The change was free. It’s likely that I will end up in a middle seat in the back (the only seat currently showing available on the map), but that’s just fine with me. Taking advantage of the free award change will allow me to sleep in, spend a productive half-day at work, and save 3 hours of travel time. If you book an award ticket, don’t stop looking for better options. Most airlines will allow you to rebook award tickets if a schedule change disrupts your itinerary. American Airlines allows you to change award tickets for free as long as the origin and destination don’t change, and as long as the dates don’t change within 21 days. Alaska Airlines also allows free changes or cancellation as long as it is done outside of 60 days. British Airways allows you to entirely cancel an itinerary (with a return of your points) if you forfeit the taxes paid. And Southwest Airlines allows award changes and cancellations with no fee at all, right up until 10 minutes before your flight leaves. Award tickets often offer flexibility that paid itineraries don’t, so take advantage! Michael on Xiamen Air Transit Hotel Disaster!